Stand Up To Cancer (SU2C) is set to launch a new public service announcement (PSA) campaign in collaboration with SU2C Founding Donor Major League Baseball. The PSA, titled “Whatever It Takes,” features Major League players and moments from MLB’s Championship Season that underscore the message that the end of the fight against cancer is unlikely to come from a single “home run,” but rather will be the result of numerous and smaller, yet meaningful, scientific advancements that keep the fight moving forward. The broadcast PSA will debut Saturday, Oct. 28, during Game Four of the 2017 World Series. Continuing a proud tradition that launched in 2011, the 113th Fall Classic will feature a moving tribute in the form of the “SU2C Placard Moment” following the end of the 5th inning. 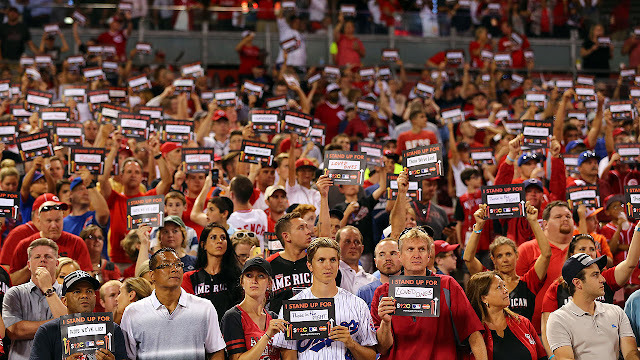 Thousands of fans in the ballpark will hold cards to honor those currently in the fight or who have been lost to cancer. MLB and its 30 Clubs are the founding donors of SU2C, committing $43 million to date to SU2C’s innovative cancer research. In addition to the broadcast PSAs, a print PSA will be launched that features images of Major Leaguers Jason Kipnis (Cleveland Indians), Michael A. Taylor (Washington Nationals), and Yasmani Grandal (Los Angeles Dodgers). In both PSAs, the players, each of whom appeared in the 2017 MLB Postseason, prepare to drop down bunts alongside photos of 10-year-old cancer survivor Jacob Teel of Delight, AR, and 33-year-old cancer survivor Dalia Margolis of Los Angeles, CA. Teel, who has battled cancer three times in his young life and was diagnosed with acute lymphoblastic leukemia at the age of 3, became an instant media sensation after appearing in the All-Star Legends and Celebrity Softball Game this past July during MLB All-Star Week in Miami. Teel hit a single and scored the first run for his team after MLB Network Analyst and former MLB All-Star Pitcher Al Leiter asked Teel to pinch hit for him. Margolis was diagnosed with synovial sarcoma in 2005 when she was 22. She underwent multiple rounds of chemotherapy and was declared cancer-free in 2006. As a metaphor to describe the cancer research work being done by scientists and doctors worldwide to make discoveries that will advance new treatments, the PSA uses MLB game footage of several players executing one of baseball’s simplest, yet often effective, plays – the bunt (opposed to hitting the big home run) – to drive home the game-winning run. The PSA features the message: “As we continue to swing for the fences, at Stand Up To Cancer we know that any advancement can bring someone home. Stand up for the 16 million people living with cancer in the U.S. and Canada. Visit StandUpToCancer.org.” The TV, print and radio creative was developed by San Francisco-based Duncan Channon, a two-time Ad Age Small Agency of the Year (2016 and 2017). While we have made significant progress, there is much left to do in the fight against cancer. The disease still affects 1 in 2 men and 1 and 3 women in the U.S. Since SU2C’s launch in 2008, Major League Baseball has provided year-round promotional support, including featured spotlights during the World Series, the MLB All-Star Game and many other individual games and activities throughout the year. Songs for Film & T.V.